iMacros introductio, downloads, addons for firefox, google chrome, IE. Latest working scripts, creating or recording scripts, common errors, problems with solution. Facebook auto-like, auto-unlike, auto-add all friends to group.Twitter auto follow random accounts, auto unfollow all twitter accounts. Introduced in 2001, iMacros enables users to capture and replay web activity, such as form testing, uploading or downloading text and images, and even importing and exporting data to and from web applications using CSV & XML files, databases, or any other source. The team at iMacros is dedicated to designing and developing quality products that simplify Web management tasks, provide real-business value, and give their customers more time each day to do what they really enjoy. This version includes both the Standard and Enterprise editions. As a 30-day trial user, you’ll have access to the full functionality of the iMacros Enterprise Edition. After 30 days, the software downgrades to the free version, which is equivalent to the iMacros Internet Explorer Browser add-on. No special System Requirements for any iMacros version. Click here to download latest version. Automate Firefox. Record and replay repetitive tasks. If you're tired of manually visiting the same sites, filling out forms, downloading files and extracting data, then iMacros is for you! Save time, effort and money with iMacros browser automation! Click here to download latest version. Chrome extensions can not write files by default. This means the default install of iMacros for Chrome V8 and higher allows you to only store macros in bookmarks. Click here to download latest version. Two separate versions for Windows 32-bit Systems and Windows 64-bit Systems are available. Compatible with IE8 and later. However no one uses Internet Explorer these days, if you're still using it please switch to firefox or chrome. Related searches: Facebook auto-like, auto-unlike, auto-add all friends to group.Twitter auto follow random accounts, auto unfollow all twitter accounts. Let us know in comments if you need any other imacro script. This video shows official tutorial by the makers. Many people doesn't find this useful, so I'll post my own version of the tutorial on YouTube soon. Easily record any task using three great modes i.e experimental event recording mode, conventional recording mode and X/Y position mode. Edit any iMacro script easily any time. User friendly commands like WAIT, URL etc. This problem usually arises when you update you browser and this new browser version is not supported by your iMacros version. Solution: use older stable version of browser or wait for newer version of iMacros. 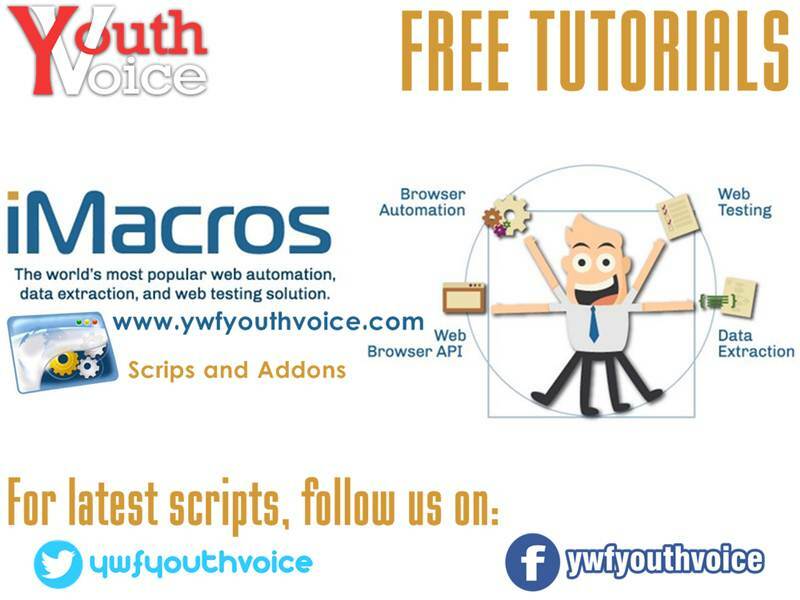 They are automatically explained in simple language by iMacros, edit your script to avoid error or find a solution by recording through a different method.